It’s been a busy week. My wife and I hosted our annual Christmas party for all of our friends, well all the friends we could fit in our house. I was grilling up a storm, I cooked a ham on my gas grill and seasoned it with a brown sugar coating, brined and smoked two turkey breasts on my egg. I was wrapped up in the party preparation frenzy that I forgot to take any pictures, next year I’m going to hang my camera around my neck so that I don’t forget. That is if Santa brings me a new camera. 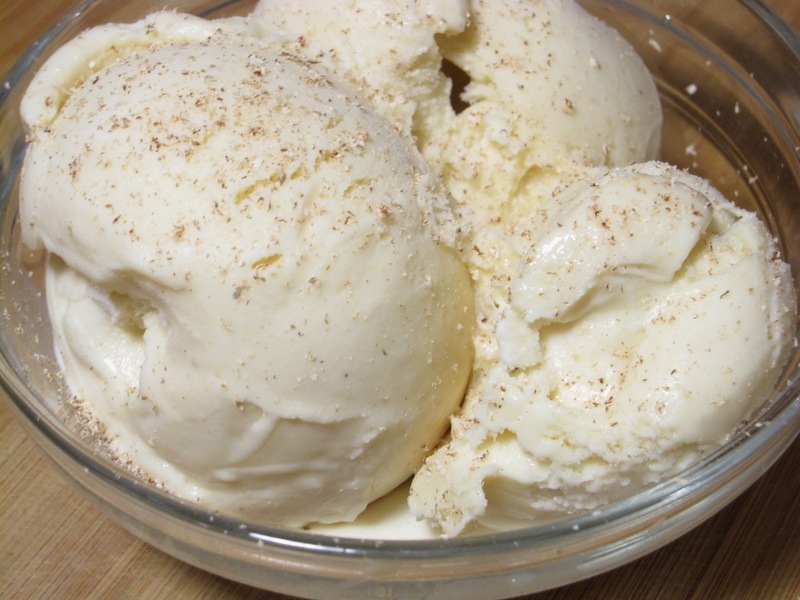 All is not lost my friends, I do have a recipe and pictures of a dessert to share with you all, Eggnog Ice Cream. Up until now all of my posts have been devoted to meat, but I have secretly been cultivating another passion, ice cream. A few years ago my mother-in-law gave me an old ice cream maker she had and was not using. This maker is as old as I am but it still works and cranks out ice cream magic every time. I mixed all the ingredients except the spices in a large pitcher and blended with my boat motor, aka submersible blender. I know this does have raw eggs in it but I don’t cook the mixture, the freezing process will accomplish the same thing as cooking. If I had to cook my ice cream mixture every time I would be a lot thinner. I added my spices to taste, but if you don’t want to taste it because of the raw eggs, just smell it, if it smells like a good spicy eggnog, it’s good. This base is really rich and sweet and can hold a good bit of spices without overdoing it. Chill the mixture for a few hours before adding it to the ice cream maker, this is especially important when using one of the frozen bowl mixers. Pour the mixture into your ice cream maker turn it on and wait for the magic to happen. Once the ice cream is done either eat all of it right away or freeze it until it’s hardened, then eat it until your sick. Isn’t that the way your supposed to eat ice cream?? After years of research and many batches of ice cream that turned to frozen ice milk I am going to divulge my secret ingredient. I stumbled upon this trick by reading the ingredient list on a carton of ice cream. This secret will add creamyness and texture to the ice cream. Most importantly is will keep the ice cream from forming ice crystals and turning into frozen ice milk when you put it in the freezer. Are you ready? 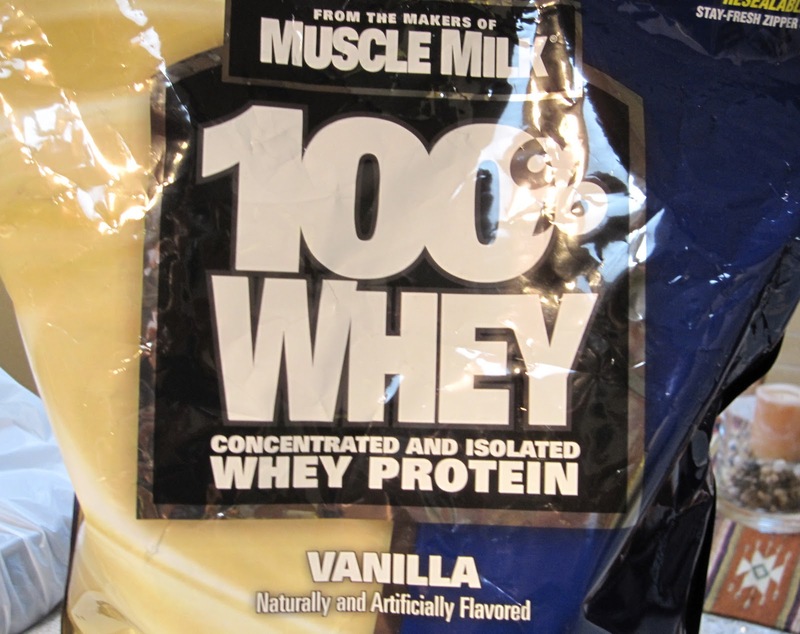 The secret ingredient is…..wait for it…..vanilla whey protein! I mix 1 scoop which is about 1/3 of cup in with the liquid ingredients. Just a note, unflavored whey protein will work, but it is sour and bitter and might require some sugar or sweetened milk to offset the tang. 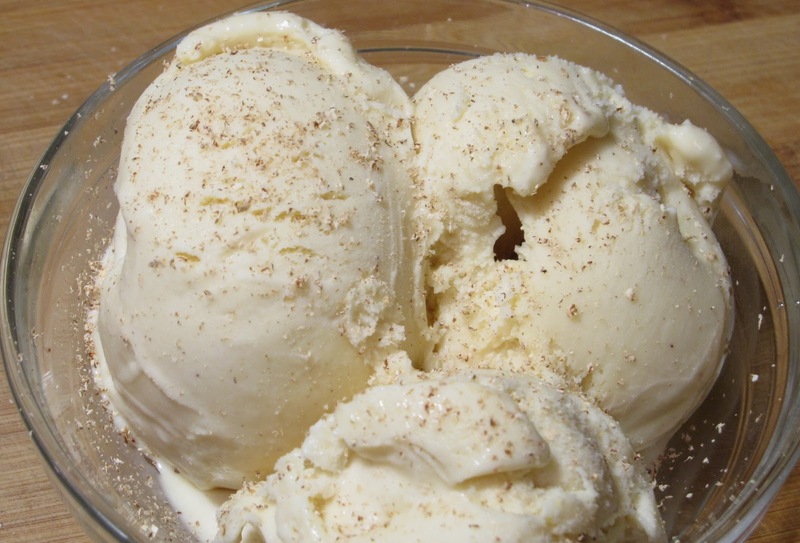 Here’s one last picture of the eggnog ice cream topped with fresh grated nutmeg. Well that’s it, my secrets are out. I make ice cream and have shared my secret ingredient. What’s left for me to tell? Grill on my friends, but in this case scream for some ice cream. Although I am not a fan of eggnog this looks yummy Kirk! 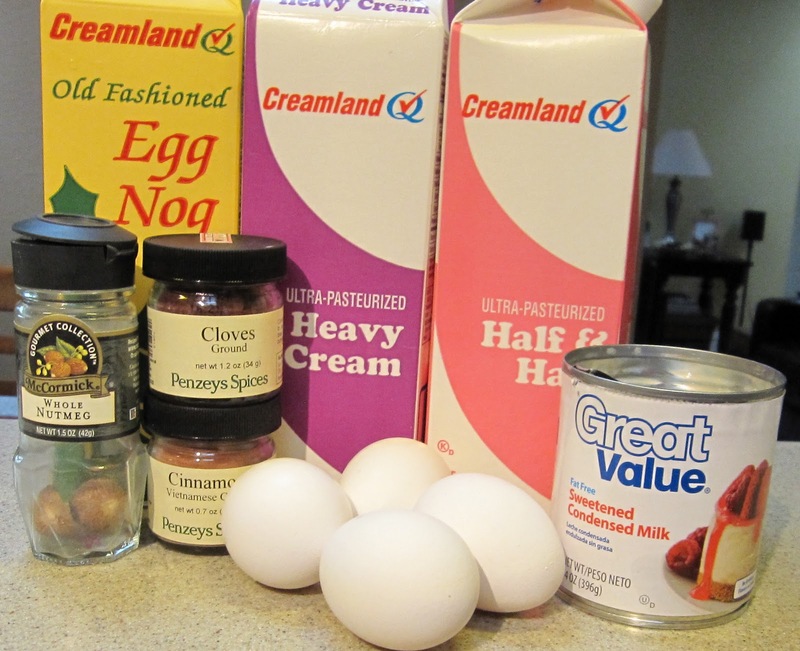 My wife will love this eggnog ice cream recipe, she just saved one for eggnog bread.